Scudder named Cobweb Skipper after Mitia, (or Metea) a chief of the Potawatomi tribe living in the area around Fort Wayne, Indiana. After fighting valiantly against the English settlers, Metea was ultimately forced to cede much land to them. Perhaps the name is more apt for this skipper than Scudder knew? (A beautiful hand-colored lithograph of Metea is reproduced in Zirlin 1995). Scudder had described this species by 1864, from a single female specimen from Connecticut. But he knew comparatively little about its distribution or life history. “In Massachusetts it has been found several times, but never abundantly, in the immediate vicinity of Boston...(1889: 1652).” Scudder is no doubt referring to F. H. Sprague's collecting in Wollaston (Quincy); Sprague found this skipper there, (Sprague 1879) but only three of his specimens (5/17/1886, 6/1/1897) are presently to be found at the Harvard MCZ. Scudder mentions two additional locations, Springfield and especially Middleboro, where Cobweb was “common” and from where he obtained some caterpillars to raise. Cobweb was also collected in Wellesley in 1896; two Denton mount specimens are in the MCZ. In addition, at Boston University there are turn-of-the century specimens from Milton (1898), Milford (F. S. Sanborn), Framingham (C. A. Frost, 1906), and Bristol, R.I. (H. Clark, 1906). Cobweb Skipper was probably as uncommon in the 19th century as it is today. By the 1930’s, Farquhar (1934) is able to cite specimens from a few more localities in the state: Stoneham and Weston near Boston, and Framingham, Phillipston and Ware further west. Specimens from the 1920's and 1930's from Weston and Wellesley are in the Harvard MCZ; also there are seven specimens taken 5/5/1942 by Vladimir Nabokov at his favorite spot in Wellesley. Jones and Kimball (1943) report only one record from Martha's Vineyard, and no records from Nantucket. (The Vineyard record was 5/26/1939, L. Cleveland, caught in a light trap, which seems a little odd since this species does not fly at night). However, W. P. Rogers collected many (15) specimens along the southern Bristol County coast between 1935 and 1951, and also one from Scudder's Middleboro location (Yale Peabody Museum). Cobweb Skipper was found in Belmont, Lexington, West Acton, and Walden Pond Reservation in the 1960's (C. G. Oliver specimens, Yale Peabody Museum); and in Medfield, Needham (Babson Park), Millis, Wareham, and Dover in the 1970's (R.E. Grey, J. S. Ingraham, Yale Peabody; W. D. Winter, Harvard MCZ). W. D. Winter took 14 specimens from a Medfield location in 1974 and 1976. New colonies were found at Cape Ann in 1967 and at Montague Plains in 1973 (Lep. Soc. Seas. Sum. and Corresp. 1959-1981). William D. Winter also documented Cobweb Skipper in the dry sandy habitat at Concord, New Hampshire (MCZ, 5/21/1982). Cobweb is an interesting skipper of dry grassy openings, with a very spotty range in eastern North America, mainly east of the Appalachians. It has occurred north to northern New York and Vermont, but is very scarce in Maine, where it is listed as a species of Special Concern (http://mbs.umf.maine.edu/Butterfly%20Species%20List%209.htm). Shapiro (1970b) noted a disjunct between populations east and west of the Appalachians. He speculated that as glaciers retreated Cobweb Skipper moved north both along the eastern coastal plain and separately in the Mississippi River valley, and that it did not move west to east during the xerithermic period. But Heitzman and Heitzman (1969) observe a clinal trait gradation from the typical H. metea found in New England to the much darker and larger H. metea licinus (Edwards) of Texas and Missouri. Cobweb Skipper is usually found on dry, acid sandy sites, or sometimes rocky sites such as ridgetop openings in forests. Both areas are often kept open through fire and blow downs. Cobweb is most likely to be found in large, established stands of little bluestem, rather than, for example, in thin stands stretching along roadsides. Little bluestem must be the dominant element in the vegetation. Cobweb may be found along some railroad tracks (e.g. Shapiro 1965, in Pennsylvania and New Jersey), and along power lines. Cobweb is the earliest emerging grass skipper in our area, flying only between early May and mid-June, and is thus dependent on early-blooming nectar sources, such as wild strawberry, wild geranium (G. maculatum), cinqfoils, mustards , heaths, and violets, although some observers report that Cobweb is seen only occasionally at flowers. Cobweb Skipper has a fascinating and unusually complicated life cycle, because it is fire-adapted (Heitzman and Heitzman 1969). During the first few instars the larvae feed nocturnally, remaining hidden during daylight hours. The later instars live deep within the base of little bluestem plants, actually tunneling below ground level and spending long periods there in aestivation during the late summer, where they are protected from ground fires (Shapiro, 1974). When the first cold weather of fall arrives, the fully-developed larvae hibernate between grass blades deep in the center of the plant, in a chamber thickly lined with silk. Heitzman and Heitzman never did find a pupa, and they speculate that larval mortality is high. Our three Hesperia skippers---Cobweb Skipper, Leonard's Skipper, and Indian Skipper --- are all about equally Uncommon in Massachusetts today, as measured by MBC 2000-2007 sightings, and there is no change from the Atlas rankings for these three (Table 5). Of the six “dry meadow skippers” (Table A), Hobomok Skipper and Dusted Skipper are somewhat more common. MBC sighting reports 1992-2009 (Chart 90) suggest that concern is warranted about Cobweb Skipper. Sightings per total trips decreased sharply from 1992 to 2006. Even if 1992 is omitted due to the rather low number of trip reports, there is still a downward slide from 1993 to 2006. After 2006, sightings of Cobweb began to increase somewhat. List-length analysis of MBC data by G. Breed et al. (2012) found a statistically significant 67.1% decline in the detectibility of Cobweb Skipper between 1992 and 2010. These two different methods of analysis agree -- Cobweb Skipper has been declining. As noted in Table A, our three Hesperia skippers, Leonard's, Cobweb and Indian, are all showing downward trends, according to both list-length analysis and numbers seen per total trip reports. The Atlas had found Cobweb Skipper only in the eastern half of the state, and in a few blocs in the Connecticut River valley. BOM-MBC records (Map 90) push the known distribution further west across Worcester County, and add many reports from Franklin County, but there are still hardly any records from Berkshire County, and the species must be presumed rare west of the Connecticut River valley. The only two western Massachusetts reports are 1, Mt. Greylock, 6/12/2005, M. Lynch and S. Carroll, and 1, Rowe, 6/14/1996, D. Potter. More searches should be made on Mt. Greylock at the proper time for this species. 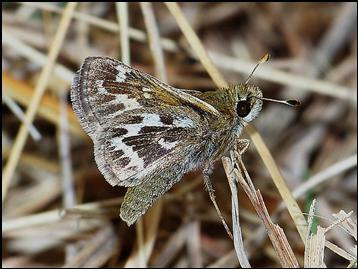 Cobweb Skipper has been found in only 57 of the 351 towns in the state 1992- 2013, whereas Leonard’s and Indian Skippers have been found in 85 and 93 towns, respectively. In north central Massachusetts, Turner’s Falls Airport in Montague is a pine plains habitat from which Cobweb Skipper has been reported. The most recent report, with the highest numbers, is 21 on 5/11/2004, T. Gagnon. Other reports come from Gill (8/5/23/1994, M. Fairbrother), Orange (8, 5/22/1995, D Small), Erving (Millers Falls Airport, 1, 5/30/1999, M. Lynch and S. Carroll), Royalston, and most recently Athol pump house (4, 5/12/2012, M. Rainey (photo link above), and 8, 5/10/2012, S. Cloutier). The most frequent Connecticut River valley reports are from Northampton, especially Florence. The high count for the valley is from Florence: 45 on 5/25/2007 T. Gagnon. Other reports are from Amherst, Holyoke, and Chicopee (Westover Air Base, 2, 4/27/2012, T. Gagnon et al.). Further east, notable locations include Stow Assabet River NWR in Stow (10, 5/8/2009 S. Stichter); Uxbridge West Hill Dam (9 on 5/15/1999 T. and C. Dodd); Worcester Broad Meadow Brook WS (max. 31 on 5/20/2001 G. Howe, but recent counts much lower); and Sherborn power line (max. 5 on 5/20/2000 B. Bowker); as well as areas in Foxboro (max. 20 5/28/1994, B. Cassie), Easton (max. 20, 5/20/1995, B. Cassie), and Sudbury (max. 12, 6/5/1994, R. Forster). North of Boston a key location is probably still Middlesex Fells in Medford/Winchester (20 on 5/2/2010 M. Arey; 7 on 5/22/1995 B. Malcolm). In Essex County Cobweb Skipper appears to be scarce today, with singles reported only from Andover and Gloucester, but earlier Atlas observers put more effort into this area and reported it from Essex, North Andover, Newbury and Salisbury. In the southeast, the two known current sites are Plymouth/Carver Myles Standish SF ( 8, 5/26/2007, T. Murray, E. Nielsen, et. al., 7, 4/28/2012, M. Arey, and 4, 5/19/2013, S. Moore et al. ), and Dartmouth Noquochoke WMA, where it was reported present by Mello May 19, 1998. W. P. Rogers' sites from the 1940's around Fall River (Bliffin's Beach), Swansea, and Somerset probably no longer provide Cobweb Skipper habitat. The Atlas reported it from Attleboro, Freetown, Easton, Taunton and Middleboro. 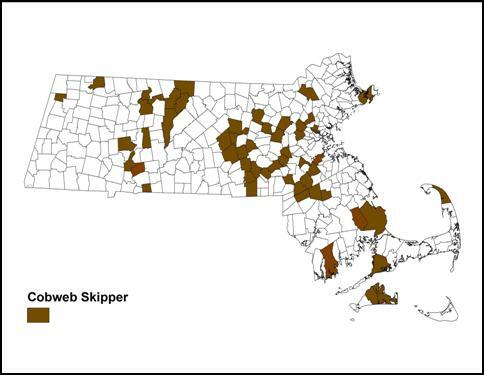 Cobweb Skipper has now been reported, though not with great frequency, from Cape Cod. The Atlas had not found it there. The primary location is Falmouth Crane WMA, but there are also several reports from Truro Pamet, the latest being 2, 5/17/1998, T. Dodd et al., and 1, 5/14/2000, B. Nikula. Mello and Hansen (2004: 61) suggest it can be found at Pilgrim Springs and Wellfleet Bay WS. BOM-MBC has no reports from Wellfleet Bay WS. From Crane WMA, 4 were reported 5/12/2001 by D. Peacock and E. Crowley, and Mark Mello and others found approximately 3 there on May 27, 1998 during a survey for state-listed species (Mello 1999). On Martha's Vineyard Cobweb Skipper has now been reported regularly and in very good numbers by Matt Pelikan and others. Productive locations include Edgartown (Edgartown SF max. 19 on 5/19/2002, M Pelikan), Tisbury (Old County Rd max. 8 on 5/19/2003 M. Pelikan), and Oak Bluffs. The Vineyard checklist ranks Cobweb as “Common” (Pelikan 2002). The Atlas had not found it on Martha’s Vineyard, and Jones and Kimball (1943) had only 1 report, so Cobweb Skipper may have increased on the Vineyard since the 1940’s. The MBC has no reports from Nantucket, nor does the Atlas, and it is not historically reported for that island (LoPresti 2011). Nor is it reported from the Elizabeth Islands or the Boston Harbor Islands although other dryland skippers such as Crossline and Tawny-edged are found on the Elizabeth Islands, and Hobomok and Long Dash on the harbor islands (Mello 1998, 2003). NOTE TO AMATEUR COLLECTORS: PLEASE DO NOT COLLECT THIS SPECIES. THIS SPECIES SHOULD BE COLLECTED ONLY AS PART OF SCIENTIFIC RESEARCH UNDER INSTITUTIONAL SPONSORSHIP, AND WITH NECESSARY PERMITS. Cobweb Skipper is univoltine throughout its range, like Leonard’s Skipper. In Massachusetts, MBC sight records 1993-2008 show it flying from early May to mid-June (http://www.naba.org/chapters/nabambc/flight-dates-chart.asp). Earliest sightings: In the 23 years of BOM-MBC records 1991-2013, the six earliest "first sightings" are 4/27/2012, Chicopee, T. Gagnon; 5/1/2010 Carver Myles Standish, M. Arey; 5/4/1991, Worcester, T. Dodd (also the Atlas early date); 5/5/2002 West Tisbury, M. Pelikan; 5/7/2013 Middlesex Fells, M. Arey and 5/7/2000 Sherborn, R. Hildreth. The influence of the very early and warm springs of 2012 and 2010 can be seen here. Thus in 5 out of the 23 years the first sighting was in the first week of May (5/1-7). In another 8 of the years, the first sighting was in the second week of May (5/8-14). These early flight dates suggest that there has been a strong change toward earlier emergence since Scudder reported in the late 1800s. Scudder, who is usually referring to the latitude of Boston, wrote that Cobweb “appears on the wing in May, usually during the early part of the last week but occasionally even by the middle of the month” (1889:1653). In 1878 the earliest that F. H. Sprague observed Cobweb Skipper in Wollaston was on May 23 (Sprague 1879). Latest sightings: In the same 23 years of records, the six latest "last sightings" are 15 June 1997 Northbridge, R. Hildreth; 14 June 1996 Rowe, D. Potter; 12 June 2005, Mt. Greylock, M. Lynch and S. Carroll; 11 June 1992 East Longmeadow, B. Cassie; 11 June 1994 Milford, R. Hildreth; and 11 June 2001, Broad Meadow Brook Worcester, G. Howe. A century ago Scudder wrote that “the insect continues on the wing throughout June" (1889: 1653). Neither Atlas nor BOM-MBC records show the flight continuing to the end of June. MBC records show the peak flight weeks to be the third and fourth weeks of May; then the flight tapers off through the first two weeks of June (Nielsen 2008). The outlook is bleak for the univoltine dry upland skippers, Leonard’s, Cobweb and Indian, for several reasons-- including host and habitat specialization, limited reproductive capacity, and climate warming. Among these skippers (Table A), the Cobweb is the most host plant and habitat specialized. For these reasons it is here designated as a Species of Conservation Concern in Massachusetts. In neighboring states, Cobweb Skipper's status is tenuous. In Connecticut, the 1995-99 Atlas found this to be an “at risk” species which “may be in decline” (2007: 293); there were with 104 pre-project records compared to only 19 project records. In Maine, Cobweb is a species of “Special Concern”, with a state rank of S2S3. The Maine Butterfly Survey has recent or historical records from only a few townships in southern Maine (MBS 2010; NatureServe 2010). In Vermont, Cobweb is currently one of the sixteen butterfly species “of greatest conservation need.” It has recently been confirmed in only two townships in southern Vermont, although older records show it somewhat further north in the state (VBS 2010; BAMONA 2010). In New Hampshire, Cobweb is known from only 3 post-1990 sites in southeastern counties (NHNH 7/2010). In these states, as well as Massachusetts, extent of suitable habitat may be the limiting factor. Cobweb Skipper does have a localized, though spotty and high-elevation, southern range, and may be able to emerge earlier if climate change leads to earlier spring warming in Massachusetts. But it may never become common, since it is habitat-restricted and apparently univoltine throughout its range, even in the south. Given appropriate habitat, it may be able to extend its range northward as climate warms. As noted above, Cobweb Skipper appears to be somewhat fire-adapted, with larvae tunneling underground to survive late summer ground fires. Shapiro (1965) says that Cobweb will re-colonize a burned site about two years after a burn, assuming an occurrence exists nearby. It should not be difficult to preserve and manage good examples of large, dry native-grass meadows, where little bluestem predominates, if their usefulness to biodiversity is more fully recognized. But Cobweb Skippers are not adapted to well-watered suburban back yards, and butterfly gardening will probably be of limited assistance.